When you consider buying a chandelier particularly that of the antique type, it is necessary to choose the right one, or it can completely mess up the overall appearance of the room it is installed in. There are numerous factors to take into account such as the size of the room, height of the ceiling, chandelier design, and so on. Specific dimensions like ceiling height and head clearance are considered for practical reasons, but the key lies in how the antique chandeliers “feels” in that space and how it articulates the void surrounding it. A common mistake people make is to install a chandelier that is way too small considering the scale of the room, so the grand effect is lost. There is no right or wrong height, or size – what matters is how the architecture and decoration of the interior scheme relates to it. For instance, neo-classical chandeliers with simple design might feel small and lighter as compared to heavier rococo or gothic versions of same dimensions. But then again, if the interiors sport minimal design, they might require more elaborately designed antique chandeliers to boost visual appeal. 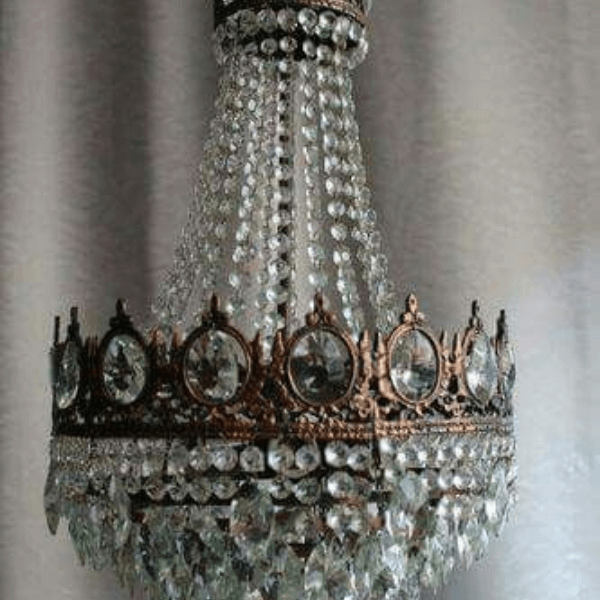 Rather than opting for gaudy designs, people prefer to keep it subtle and elegant, which is why Georgian chandeliers are one of the most popular types in the market. They are the ultimate when it comes to style and quality. Even if you hesitate due to the budget, rest assured, they will never go out of fashion and continue to enhance aesthetics for years to come. These chandeliers look stellar by creating a contrast in a minimalist setting, while imparting a dazzling vibe when surrounded by opulence. These chandeliers look grand in living rooms or in simple, contemporary hallways, but if you really want to create a magnificent effect, then install them over the dining table. Chandeliers of the 18th and 19th century are manufactured till date, so you have to be 100% certain of their age and authenticity. Keep in mind the quality of glass, weight and quality of casing, and whether the gilding or drops are original to the piece. If required, you can seek professional help before deciding on a purchase. It can take a while to pick out an antique chandelier that matches the décor of your home and suits your budget, so start immediately.